Amanda Righetti at the California premiere of "Friday The 13th." Amanda Righetti at the BAFTA LA's 2009 Primetime Emmy Awards TV tea party. Amanda Righetti at the 13th Annual Entertainment Tonight Emmy party. Amanda Righetti at the Tao Nightclub at Venetian Resort Hotel Casino. 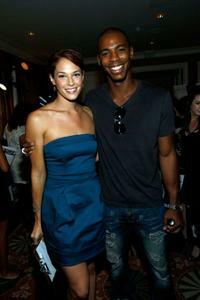 Amanda Righetti and Mehcad Brooks at the 61st Primetime Emmy Awards. Amanda Righetti at the premiere of "Whiteout." Amanda Righetti at the InStyle Magazine's 8th Annual Summer Soiree. Amanda Righetti at the CBS New Season Celebration. Amanda Righetti at the Entertainment Weekly and Women In Film's Pre-Emmy party. Amanda Righetti at the Spike TV's Scream 2009. Amanda Righetti at the TV Guide Magazine's Hot List party. Amanda Righetti at the Glamour Magazine 2009 Women of The Year Honors. Amanda Righetti at the Christopher and Dana Reeve Foundation's "A Magical Evening" gala. Amanda Righetti as Whitney and Jared Padalecki as Clay in "Friday the 13th." Amanda Righetti as Whitney and Nick Mennell as Mike in "Friday the 13th." Amanda Righetti as Whitney in "Friday the 13th."